As with other spices, it's not only in your cooking that you get to appreciate turmeric benefits. Medicinally, this is one of nature's powerhouses with lots of ongoing studies into its health uses! Folks have been making use of it for at least 4000 years in a variety of ways. It's thought it was originally the staining qualities it was used for before its many healing properties were discovered. Note: An ancient Assyrian text from 600 BC seems to be the first to mention using it as a dye. Not only can you use fresh root and the dried ground powder in your cooking, but with its many medicinal, health and general well-being uses it certainly is a valuable ingredient! 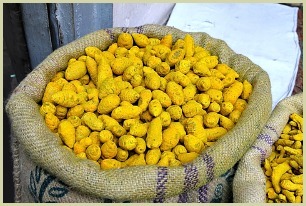 In traditional medicine, this spice - curcuma longa - has long been prized for its health and therapeutic effects. In Okinawa, Japan, they make turmeric tea which is used as a remedy for stomach problems. I occasionally make this myself. And if you are into potent cups of tea, this is definitely one to try. It's a great way of getting more of this healthy ingredient into your daily food. Click here for my super simple tea recipe. As well as traditional medicine, there are also many clinical studies looking into its active ingredient, curcumin. Note: Whilst this is a safe addition to your recipes, there are certain folks who may need to be careful with it. Read about the side effects. The textile industry also makes use of it, particularly for the dyeing of cotton and silk. Monks robes used to be dyed yellow using saffron strands, but this was obviously costly, so they now use the cheaper turmeric. Click to read more about its general uses. As well as textiles, the food industry also uses it as a dye. And it's widely used to colour some butter, pickles, chutneys, cheeses and mustards. You know that bright yellow mustard you find on every hot dog stall? That gets its distinctive colour from this spice.